As I write this at 8:30 pm California time, some 70% of the UK Brexit votes have been counted, and "Leave" is winning 51.5% to 48.4%. The betting odds on "Leave" are now approaching 100%, up from just 11% only 24 hours ago. It appears the UK will be leaving the EU, something that as recently as yesterday was "unthinkable" according to the establishment types and many market participants. The hype mustered by those favoring "Remain" has undoubtedly fueled the panic that has sent the pound down 10% in a matter of hours. 10-yr Treasury yields are down almost 25 bps, and gold is up over $50. In voting Thursday on whether to leave the European Union, the British people face perhaps the most momentous decision since Henry VIII broke from the Roman Catholic Church in the 16th century so he could marry as he pleased. Though lust is not the motivation this time, there are other similarities. The Catholic Church five centuries ago was run by an unelected supranational elite, answerable to its own courts, living in luxury at the expense of ordinary people, and with powers to impose its one-size-fits-all rules despite the wishes of national governments. We were right to leave. A centrally planned, regional customs union ... might have made some sense in the 1950s. That was before container shipping, budget airlines, the internet and the collapse of tariffs under the World Trade Organization made it as easy to do business with Australia and China as with France and Germany. Even worse than in Westminster or Washington, the corridors of Brussels are crawling with lobbyists for big companies, big banks and big environmental pressure groups seeking rules that work as barriers to entry for smaller firms and newer ideas. The Volkswagen emissions scandal came from a big company bullying the EU into rules that suited it and poisoned us. ... The de facto ban on genetically modified organisms is at the behest of big green groups, many of which receive huge grants from Brussels. ... the EU’s obsession with harmonization (of currency and rules) frustrates innovation. Using as an excuse the precautionary principle or the need to get 28 countries to agree, the EU gets in the way of the new. “Technological progress is often hindered or almost impossible in Europe,” says Markus Beyrer, director general of BusinessEurope, a confederation of industry groups. Consequently, we’ve been left behind in digital technology: There are no digital giants in Europe to rival Amazon, Google, Apple and Facebook. The EU is also against free trade. It says it isn’t, but its actions speak louder. The EU has an external tariff that deters African farmers from exporting their produce to us, helping to perpetuate poverty there, while raising prices in Europe. The EU confiscated Britain’s right to sign trade agreements—though we were the nation that pioneered the idea of unilateral free trade in the 1840s. All the trade agreements that the EU has signed are smaller, as measured by the trading partners’ GDP, than the agreements made by Chile, Singapore or Switzerland. Those the EU has signed usually exclude services, Britain’s strongest sector, and are more about regulations to suit big companies than the dismantling of barriers. The UK is right to reject the regulatory burdens heaped upon it by an extra-national bureaucracy. The U.S. would be wise to follow suit and shrink the size of our bloated government by a few notches at least. Brexit could be the beginning of a brave new world, in which trade becomes freer and business becomes less burdened by taxes and regulations. The only politician here who is talking about such "radical" ideas is Trump, but he is gaining traction, as did the "leavers" in the UK. There is room for hope. 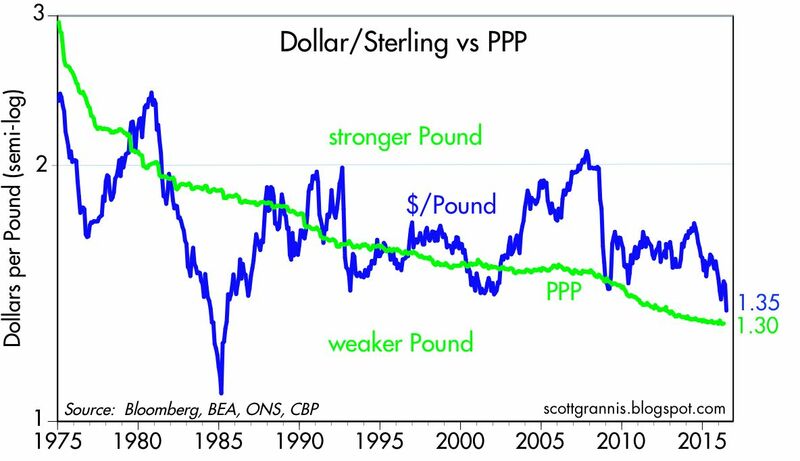 To close, the chart above puts into perspective today's collapse of the pound vis a vis the dollar. 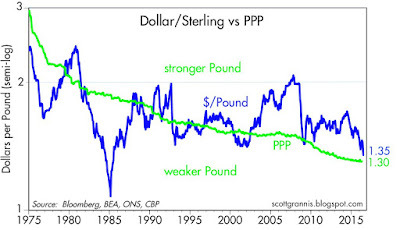 As I see it, the current exchange rate between the pound and the dollar is reasonable (finally), and it has moved, over the past 40 years, pretty much in line with the differential between US and UK inflation (the green line is representative of how the exchange rate would have moved if it exactly reflected inflation differentials over time). Looks like a buying opportunity. But I am often not right on these matters. Scott, any inklings on what's going to be the best buy amidst the market over reaction? I'm guessing the S&P500 is going to be available at a nice discount, but it seems like the pound is going to take the worst beating of all. Any idea what this might do to REITs if anything in the short term? Thank you for another post! Well, it looks like the pound has already bounced a little since my post. But if you want my guess, I would say that it's going to get ugly for awhile before things really have a chance to bounce convincingly. For how long? I have no idea, unfortunately. I'm going to be on the lookout for any genuine bargains that happen to come along. The pound is not cheap here, for example, despite the fact that it has dropped considerably. It will be interesting to see if the market figures a Brexit will put all central banks on indefinite hold, and if that in turn will result in an inflationary impulse (money supply exceeding money demand). If it does, that could be a big boost to REITS. One of the attraction of REITs in recent years has been their ability to act as an inflation hedge (should inflation start to quicken) while at the same time paying a very attractive rate of interest. Thank you for being so generous in sharing your thoughts on the market, it's been a huge help for my continued education. Yesterday, I exited a 2ish year position in the vanguard admiral REIT, which returned 26.2%. I made the investment based on one of your crystal ball forecasts for the year. I'll be reinvesting the capital into either the S&P500 or back into the same fund if it's available at a discount in the coming weeks/months. Love the REITs. If what Scott Grannis says is true, that central banks have to (relatively) ease, then good. I am sure the ECB is a bad idea and I suspect the EU is sclerotic too. Britain needs smaller government and to de-zone property. Trade laws are of less importance. Britain is finally giving Free Trade a chance. The EU has not been very good for their wallets. Im gonna buy some English BEER this weekend in solidarity! Trump came out in support of the vote, Biden said he was disappointed in the British people. The Obama lectures didn't work. Markets at some point will remember that freedom and sovereignty are better ways to live and to create the most prosperity for the most people. Probably not today. But soon. S&P futures halted limit down overnite. That may take some time to play out, but that won't last. Freedom works better. In the meantime, gold and long US treasuries...this years relative strength winners (up 18% and 15%+ ytd)...are soaring on the panic. Gold miners up 85% so far std and up 10% pre-market. Gold hitting 2 year highs. Long Treasuries hitting 2012 levels overnight. Im making good money off that, but its nothing but fear, fear, fear. Soon its going to be time to swap all those into stocks. Maybe Germany will start a war to see who has to pay off all that EU debt! They are going to be left holding the wet bag one day with a DM that is sky high. Scott: Are swap spreads telling you anything new? Re: swap spreads. US swap spreads are almost unchanged and very low, down about 1 bps; 2-yr swaps now 12 bps vs 13 yesterday. Eurozone swap spreads are up 4 bps and not yet in what might be termed a danger zone. 2-yr Eurozone swaps are now 44; a month ago, before Brexit fears started to heat up, they were 36. So whatever problems a Brexit brings, they are not likely to sink the banking system or starve the world for liquidity. "The best thing the UK could do upon exiting the EU and its treaty obligations would be to do nothing: simply open itself to all international trade. Who needs treaties, when the country that most benefits from trade is the one that restricts it the least? The best solution for a Brexit is the easiest." "Open itself to all international trade"
Scott, sure that works just fine for imports, exports not so much. Moreover, a surprisingly large percentage of UK trade are services, and not goods. JP Morgan said it best: "we will do what we must to serve our clients", than could mean moving some of its 16,000 UK based employees elsewhere. The economic arguent for leaving Europe was that "all that goodness" never trickled down to the average English person. Median wages in the UK are stagnant or falling -- so they never saw the value added of being part of the EU. As for rules and regulations; if the Brits want to sell the Europe, they will have to abide by these rules (or not sell and shut up). Anyone who deals with Europe will have to follow European laws and rules. "Opening the borders to all trade" has got to be your most idiotic comment ever! BTW, now, if the UK wants "redress in trade" it will have to go to the WTO (I am relatively they too are bureaucrats and surprisingly useless at that). What we have here the voice of "Little Englander" the jingoist lower middle class racists who sees all foreigners as pox ridden wasters. Their real argument is that they got little benefit from joining the EU, in fact, their wages may have fallen. In short they got screwed and gave the finger to everyone around. America's answer to that is Mr. Trump! Only "idiotic" "little people" and "jingoistic lower middle class racists" are against being ruled by unelected bureaucrats, with no political mechanism for removing them from power. Everybody else LOVES it!! Especially in the frozen north. How dare they be so insolent and disrespectful. Just a bunch of rubes pouting. If only they understood basic central planning so they could learn to embrace that 1% GDP. One time the Eurozone had a 1.3% quarter! Their best ever in history!! A record!! Yay! Embrace!! Richard Haass, head of the CFR said this morning: "Important decisions should never be left to the passions of The People." He mad. So brave. Nobody "needs" freedom with such noble caretakers. UK stock market closed today UP 2.3% for the week. Best week in 4 months. That didn't make the news. Interesting indeed. FTSE is down over 13% from April '15 however. But it is up 14% relative to the Euro Stoxx index since November '15. Today, UK stocks beat Euro Stoxx by 4%. This obviously suggests that the UK will benefit from leaving the UK, at least in a relative sense. Trump contradicts his policy positions everyday, and he is demonstrating that he is not particularly bright, except as a carnival barker. Scott said, "The best thing the UK could do upon exiting the EU and its treaty obligations would be to do nothing: simply open itself to all international trade. Who needs treaties, when the country that most benefits from trade is the one that restricts it the least?" I completely agree! Ronald Reagan was just a stupid actor. This was a very exciting day. Socialism is becoming irrelevant right before our eyes. Sorry, Hillary. Have you ever seen a more meaningless speech than Barack "explaining" Brexit to us today?? I'm almost giddy. Almost. All the right people are completely pissed off. Finally, the Good Guys win one!!! Sorry for the exuberance. It's a great day for Planet Earth!! I agree with Johnny Bee Dawg in one regard: it has become reflexive among globalists to dismiss all political adversaries as low-life buffoons. Are the globalists elite, fey snobs to whom money trumps patriotism, religion and even morals? Certainly a shot across the bow of Hillary. No one can deny it. I still think she'll win easily. In fact, I don't even think Trump WANTS the job. He just keeps getting more and more bombastic! I just don't think there are enough pissed off white people to get him in. Haven't been wrong in forty years on a presidential election-but this could be a first! "In fact, I don't even think Trump WANTS the job." I agree with that. Trump is like the dog who caught the car. I think his main goal right now is to set it up so that he can blame the "Crooked" Republican Elites for not supporting him if this turns out badly. And he still has to get through Cleveland - there will be many looking for a chance to spike Trump at the convention.